Welcome to the start of your Salmon fishing experience near Fort William in the Highlands of Scotland. From January to May most of our Salmon fishing days take place on the River Garry and River Oich and are about chasing “springers” that come in from the east coast of Scotland. 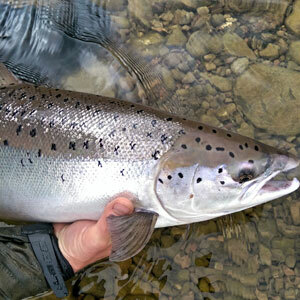 From May through to mid October we also like to use the River Lochy in Fort William which also has a good run of large fresh spring fish during May and June. The River Lochy has a history of extremely large Atlantic Salmon with a good friend and fellow guide having caught a prize winning 40lb Salmon in 2017. We can’t guarantee that you will catch a Salmon but we will do our best to help you to learn to cast your fly into the pools to give you the best chance possible! Our choice of river will be dependant on availability of fishing beats (permits) which can get booked up. Of you have a preference in venue then please book early in order for us to be able to book the venue and guarantee availability. We work on a ratio of 1 guide for up to 2 clients.